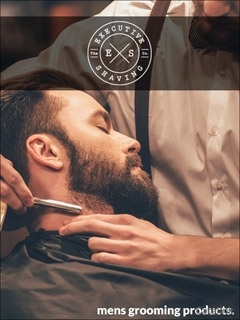 To sign up to the Executive Shaving - Men's Grooming Newsletter, simply click the Request Newsletter button below and you will receive amazing special offers, discounts and access to secret sales. Enjoy the classic way to shave and experience a superior, closer, smoother finish every time you shave. The Executive Shaving Company make some of the best shaving and grooming products on the market and lead the way on supplying the UK with the top brands in the world of shaving. From cut-throat razors to creams, brushes and razor blades, sign up to the newsletter to help sculpt your look and look sharper than ever before. Sign up to The Executive Shaving Company today for the best shave of your life. Executive Shaving - Mens Grooming Newsletter Allan T. said: Looked a good product. Executive Shaving - Mens Grooming Newsletter Clive P. said: A very interesting article at the beginning about the history of shaving. Become a life changer with this pack and DVD. Change a persons life forever by leaving a gift to Guide Dogs for the Blind.